Similar to football crunch time, but instead throwing footballs you are throwing playground softi balls at the backdrop. There are three holes in the backdrop. The first person or persons that have no balls on their side are the winners. Can accommodate 2 to 4 players at a time. 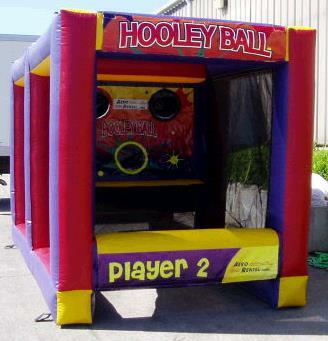 * Please call us with any questions about our inflatable game hooley ball rentals.